Paid weekly at $69 for 3 meals for 2 people. HelloFresh is a meal service which delivers fresh ingredients and healthy recipes straight to your doorstep every week. The ingredients are already pre-measured so there is no waste. Hello Fresh delivers for free across the continental United States and in Canada (Southern, Central, and Eastern Ontario only, as far North as Sudbury). Weekly flexible subscriptions are available where you can select from the Veggie, Classic, or Family recipe box. Depending on the box, between 2 and 5 meals can be ordered for 2 or 4 people. 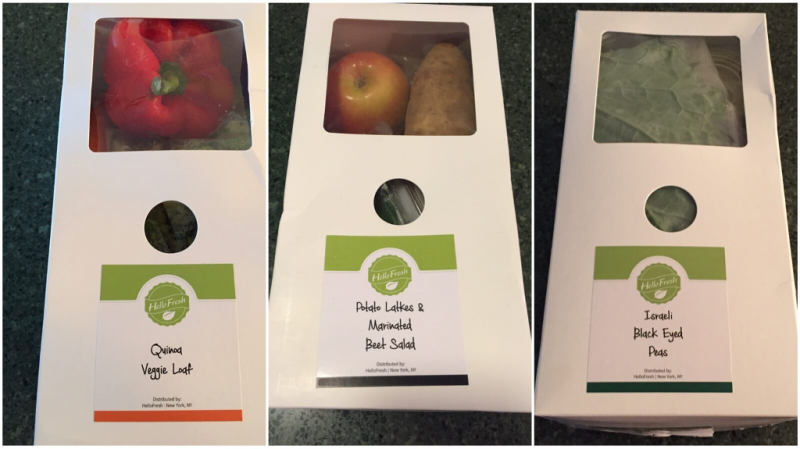 Singles also benefit from the ordering options since they can select a 2 meal, 2 person a week box which will give them 4 meals in total for the week. Once your subscription is active, HelloFresh will send you new and exciting recipes and ingredients weekly for you to prepare home cooked meals. With the Classic box subscription you can even swap out meals and choose your own recipes you want to receive so you can plan ahead with your other meals. Every week new meals are planned which can be viewed in advanced on the HelloFresh website or their iPhone and Android apps. 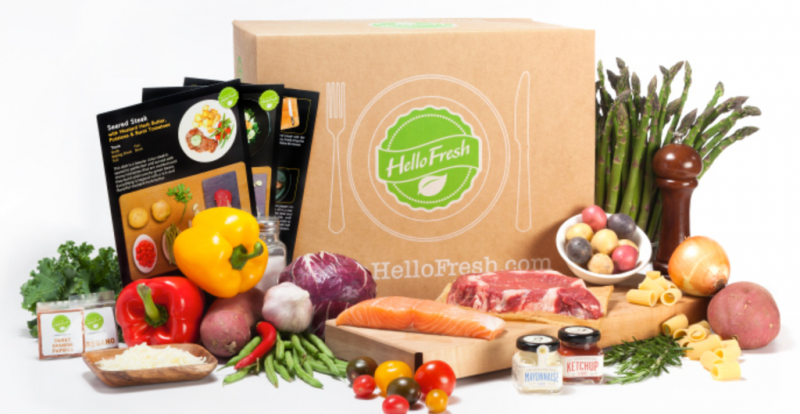 Hello Fresh was started in 2011 and shipped their first box of food in 2012. Since then they have grown in leaps and bounds. HelloFresh now serve 7.2 million meals a month to over 787 thousand regular subscribers not only in North America, but Australia and countries in Europe as well. HelloFresh.com recipe database is ever growing and now contains over 7,500 healthy and delicious recipes. As of 2017 HelloFresh launched their monthly Wine Club. First you need to create an account on HelloFresh and login. From there you can place your order of one of the 3 meal kit boxes and select your delivery date. If you have selected the Classic Box you can then check out other available recipes (5 in total each week) if you want to swap in a different meal. You can check out past, current and upcoming recipes for all 3 meal kit types on the "Our Recipes" page on the HelloFresh website. After that it's HelloFresh's turn. Each week they put together the fresh ingredients that are pre-portioned and packed in an insulated box which is cooled by ice packs. Your box is then shipped to your house based on your shipping instructions. Once you receive your order you can then unpack it and plan when you want to cook your meals. Most meals are designed to stay fresh for the week that your food was delivered on but some, like meals with fish, should be eaten earlier in the week. HelloFresh includes all ingredients in the box you will need to cook with expect for the extreme basics. The ingredients Hello Fresh assumes you have at home is salt, pepper, sugar, cooking oil, and butter. Most meals have a cooking time of about 30 minutes and on average each meal contains anywhere from 500 to 800 calories. Recipes for meals are gathered and developed by HelloFresh's team of in-house chefs. All chefs have graduated from Culinary schools. HelloFresh also has a dietitian on staff who reviews all recipes to ensure a balanced meal. Just recently The Naked Chef, Jamie Oliver, has teamed up with HelloFresh to provide quick and easy recipes each week which are flavorful and exciting to cook at home. With the HelloFresh Wine Club subscribers will get six bottles of red, white or mixed varietals (depending on plan selected) shipped to their door. Each wine will be paired with a corresponding Hello Fresh recipe for the month, one red and one white suggested, and will come with a flavor profile and tasting notes. Each month premium wines from all over the world are selected and source directly from the vineyard. HelloFresh.com offers 3 meal kit subscription plans (called Recipe Boxes). Once you select the recipe box you want, the number of people it is for, and how many meals you want to receive, the box will be delivered to you once a week (shipping is free). Subscriptions are weekly and can be deactivated or paused at anytime (for when you go on vacation, etc.). Multiple subscriptions can also be purchased. 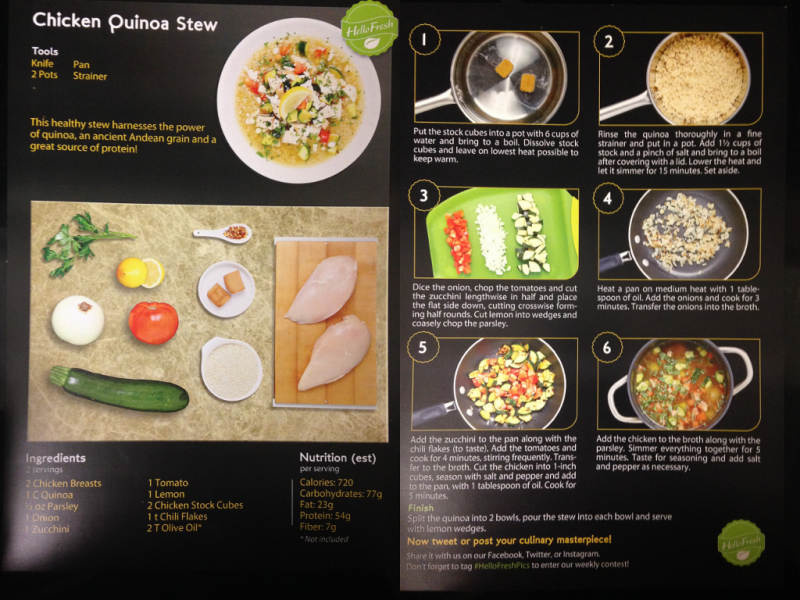 A full color recipe card with pictures and written instructions is included for each meal. The card lists the tools you will need along with the ingredients and step by step instructions for preparing and cooking the meal. HelloFresh also offers 3 Wine subscription plans which are ideal and designed for paring with HelloFresh meals. Included online for each bottle with your order are tasting notes with detailed flavor profiles. Includes meals that use seasonal vegetables, animal-free protein and whole grains. Different vegetarian recipes like soups, stews and salads (plus many more) will be included every week with your delivery. This bestseller includes meals that use seasonal vegetables, fresh meats and fish. Take the stress out of meal planning and have HelloFresh send you tasty recipes or login to the website and swap in other optional recipes the week before. * Prices based on a weekly subscription. Prices can increase/decrease depending on subscription length. All prices in USD unless specified other wise. Costs and features offered last checked June 09, 2016. 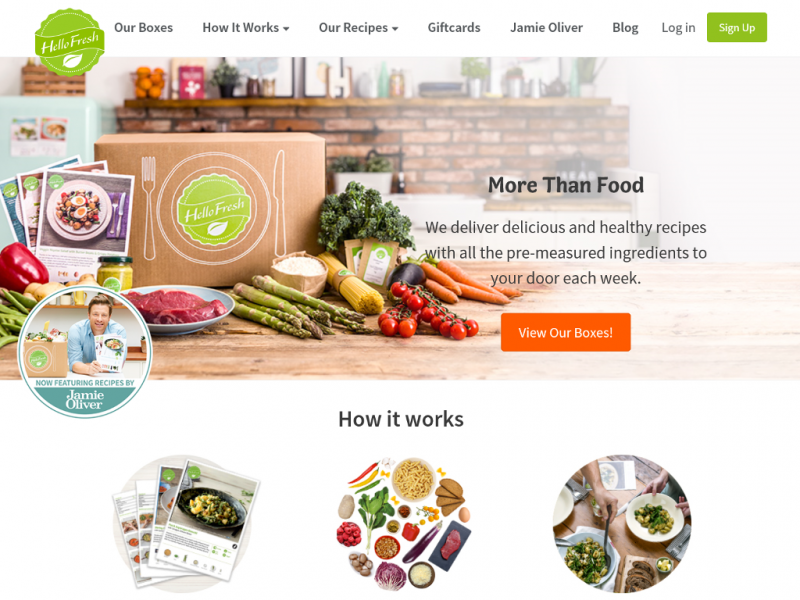 Hello Fresh delivers their meal kits all across the continental USA and within Ontario, Canada. Delivery is free and most deliveries happen between 8am and 8pm. All customers can specify a Wednesday, Thursday, or Friday delivery date with certain areas able to specify any day of the week. If you are not home during the delivery you can leave delivery instructions online that specify what you want to happen if this is the case. For example you can have the courier drop it off at a neighbor, at your work, or with someone like the concierge in a condo or apartment. 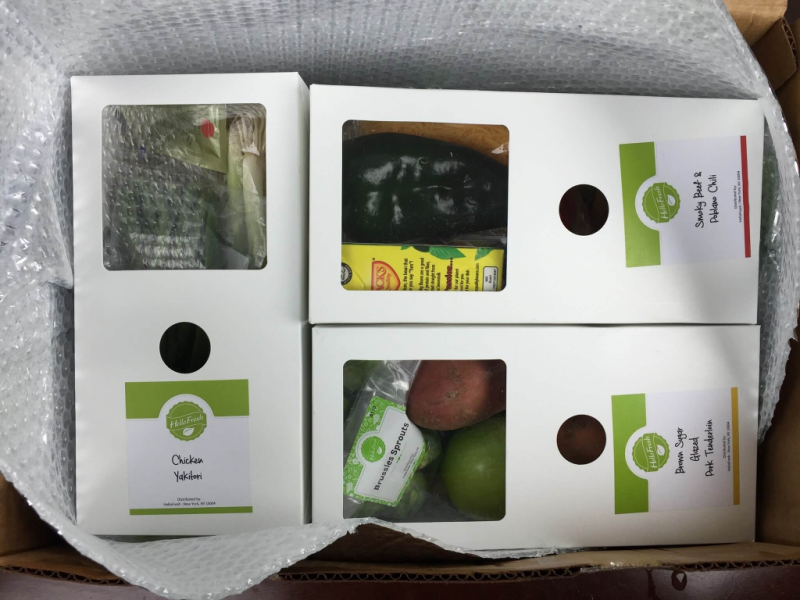 Products stay fresh during delivery thanks to specially designed boxes that include a thick liner and ice packs so the HelloFresh food will arrive nice and cold. Wine deliveries happen once a month on a date you specify at your home or business. Your delivery date and address can be changed but must happen 7 days prior to your next scheduled delivery. For all wine deliveries an adult aged 21 years or older must be present with a valid ID to sign for the delivery. HelloFresh.com offers several ways to get help. This includes an online FAQ which answers the most common questions, and several ways to contact Customer Care including email, and a toll free phone number. The also have a blog and email newsletter which includes articles on cooking tips and recipes. On the blog you can also find out more about HelloFresh food suppliers and the team behind the recipes. HelloFresh has several social media pages including Facebook, Twitter and Instagram in which visitors can ask questions and post about their experience with HelloFresh. My wife and I have been pretty happy with our meals from Hello Fresh. We started using them early last year and it's been a big stress re-leaver as we both have highly stressful jobs. The meals we prep from their ingredients have been excellent for the most part. What I really like are the flavor combinations which are unique and something we would never have considered before if we were planning the meals. You do have to be careful sometimes to use items that can go bad quickly as it may not be fresh in a few days. Prepping the meals is pretty straight forward and are easy to make. The food amount for the most part is enough for the both of us. I am a pretty big eater but my wife is not. On a few occasions some things have not been fresh. Customer service has been understanding and have reimbursed us the cost of that particular meal. Overall I have been happy with our meals. I have been using Hello Fresh for a month now so that is 3 meals for 4 weeks which is 12 in total so I think that is enough experience to write a review. My main complaint is 2 times my meals was missing 1 ingredient. Sour cream in 1 and cheese in the other. Quality control really needs to double check the boxes. Good thing I had them on hand or I would have been more angry. This is the main reason for my lower score. I also think they should cut down on all the chopping and other prep things you need to do. I am looking for a good nutritious home cooked meal that doesn't take to long to prep or use to many dishes. Some of the meals are definitely not a time saver after you include all the washing of the pots and bowls you have to use. I really wanted to like meal kits and Hello Fresh... now I am not so sure I do. Ever since I subscribed to Hello Fresh I have had problems. The first delivery was left not at the back door like requested but at the front close to a busy street. Had to call and stay on hold for customers service to correct this... UGH! The second delivery the food was put at the back door buy the shipper which is good but after I went to prepare the meal from the recipe I found I missing a couple of ingredients. The third delivery all the ingredients were their but the meat packaging had leaked in the box. Had enough so have cancelled my subscription and have decided not to look at any other meal kit services. Been using Hello Fresh for just over a month now. I am trying to eat healthier and this is the way I thought to do it since when ever I go to the grocery store I end up buying crap. I am glad I tried out meal kits. I have lost some weight now and have found out I enjoy trying different meals and cooking, who knew! Unlike some reviews I have read, the ingredients delivered to me has always been fresh. If you are sitting on the fence about trying out Hello Fresh my recommendation is to go for it. The food is fresh and well packed. I have tried a number of meal delivery services and I found Hello Fresh to be by far the best. Things I liked include the box being very organized and in packages, fresh fish/meat, and fresh vegetables, especially compared with other services. I found by using a meal delivery service that it has helped cut down on food waste (half the stuff goes bad on me in my fridge that I buy) and it really reduces my restaurant bills as we eat in way more often. Even my tween likes to keep me company in the kitchen and help cook, nothing is better than some mother and daughter bonding time. She likes trying new foods and I like how healthy it is compared to restaurant food.